The Supreme Court today said that the total ban on liquor shops along national highways would be enforced only after elaborate discussions and consultations with all the stake holders like state excise commissioners, revenue officials and also alcohol shop owners. After Attorney General Mukul Rohatgi, representing the Centre explained the draft policy on banning liqour shops along highways, the bench directed excise commissioners of all states to hold a meeting in Delhi to discuss the feasibility of the centre’s plans and come back to the court after two months. They have been given liberty to find fault with the policy if any and also make their suggestions which shall be considered. Rohatgi told the court that as per the policy no liquor outlets will be allowed within the periphery of 220 metres of the highway and also at places clearly visible from the highway. He said municipal areas will be exempted from the ban as it involved revenue issues. It is to be noted that earlier on January 13 the apex court, while hearing a PIL filed by an NGO in Haryana, had asked all the stake-holders to sit and decided on a "reasonable policy" on the location of liquor shops along the national and the state highways as it said that it did not favour people drinking travelling long distances. "It is a social issue. We don't want anybody should lose. All should sit together and have a reasonable policy. We don't want people to drink while travelling," a bench of Justice Jagdish Singh Khehar and Justice S.A. Bobde had said. Describing it as a "social issue" and presence of liquor vends on highway as an "allurement" for long distance travellers but at the same time, not wanting anyone including traders and the state to lose on its revenues, the court asked Rohatgi facilitate a meeting of all stake holders to arrive at a "reasonable policy". "Make a reasonable suggestion that is good for all. Remove it from the highways and take it at an appropriate place," the court told all the contesting parties. Senior counsel K.K.Venugopal, appearing for one of the respondent states, challenged the central government's circular restricting liquor vends on the highways saying that it involved the constitutional issues as tax and excise are within the exclusive competence of the state legislature. "If it is valid for national highways then it is very much valid for State highways," the court said as Tamil Nadu challenging the validity of the circular said that the central government had issued circular in respect of national highways and not for the state highways. Punjab and Haryana have implemented the decision, after the Supreme Court stood by a decision of the State High Court to shut liquor vends along highways to improve road safety. 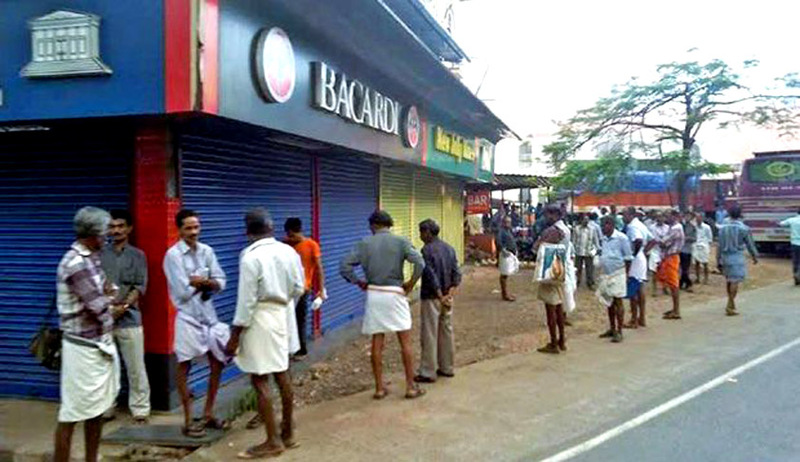 In last three months, almost 1,000 liquor vends have shut shop along NH in these two States, according to official sources. From the closed outlets, some 650 liquor vends were located along in highways managed by the National Highways Authority of India (NHAI), while others were located along the NH controlled by the State Public Works Department. "Remove existing liquor shops along NHs and (do) not issue fresh licenses to Liquor vendors for operating shops along NHs," the transport and highways ministry said in the advisory to Chief Secretaries of states. It said licensing of liquor shops is covered under Excise Policy of the states, exhorting them to act. The ministry has advised the states that they must review cases where licenses had already been given in the past to open liquor shops along NHs and take corrective action. "Intake of alcohol/drugs by drivers resulted in 24,655 road accidents and 10,553 fatalities in 2011," it said, adding that 82,807 accidents occurred between 2009 and 2011.Road accidents occur due to the complex interaction of a number of factors which also include intake of alcohol and drugs, it said.